We would like to thank you for accepting the interview with us! Most of the people reading this interview know your brand or who you are, but for those who don`t know you yet, please tells us some words about you. First of all, thank you for taking the time to speak with me. 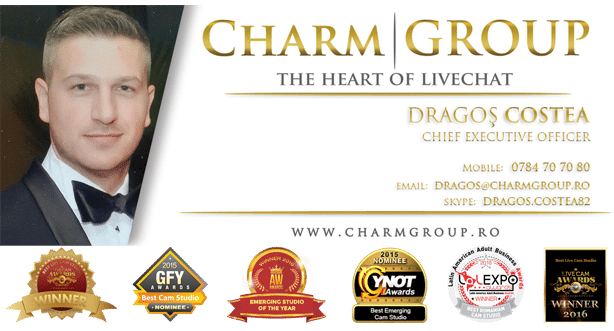 Hello, people from all around the world, I am Dragos Costea, the owner and the CEO of Charm Group. Well, to be honest, I personally don’t think that a man could really describe himself; his closest ones are the only who can fully describe his character. So, my closest ones (and I am talking here about my family, my partners, my associates and my employees) describe me as a good listener, a good friend, and a perfect mate… But I’m pretty sure I have to learn a lot, still. My journey in entrepreneurship began as a student in Economics. My first job was as a junior salesman at Grawe (a major insurance corporation), where I was promoted as a Team Leader, leading a staff of over 1.800 employees. After that, I decided that it’s time for something big, so I left my executive position and… The story of Charm Group has begun. We know that you have a history insurance field. When was the moment when you know that is time to change the path to something different? My parents taught me the most beautiful lesson of my life: that you can’t stop learning even when you grow older. In other news, the more you learn, the more you achieve. I understand that there will be always new things to learn from and in 2009 I’ve decided to take the next step. And this „next step” for me goes by the name of Charm Group. You asked me why from insurance to this industry? Even if they seem to be so different, they are not. And the background from my first job helped me a lot to improve my knowledge in this field. When did you create your first studio and what challenges did you face so far by owning a video-chat studio? As I told you before, my first contact with this industry was in 2009 and even if I don’t believe in love as first sight, it really was! This industry is a fascinating field, which has captivated my mind from the beginning and I think that every single day is a new challenge. In addition, we all know that this industry comes with a host of challenges. My very first challenge was trying to establish a brand, adjust to match and even exceed the competition and the last, but not least, to keep my business profitable. When all is said and done, it doesn’t matter how many years you’ve been in business, but how determined you really are. And I was – in my case, turnover is my proof. Growing up to the corporate ladder, I managed to improve what I achieved and put into practice here, at Charm Group. Maybe this is one of the things that makes the difference between us and the others. Can you tell us what makes Charm Group an important asset on video chat field? What makes your studio different than others? I anticipated your question, lol. First of all, picking the right team was my first asset. I trully believe that with the right people, we can conquer the world. So, yes, one of the biggest differences is our team. We make ourselves noticed by the fact that we do things in a different way. On the other hand, we like to motivate our models and to improve their activity every day, in order to do their best. Our Marketing team helps them to grow up in social media world. Why should a future model choose to work in a professional studio as yours and not on their own? Working in our professional studio has more advantages than working from home. Why? Firstly, it’s all about the costs involved. If a model chose to work from home, she’ll have to pay additional equipment, accountancy, taxes and the list goes on. Even if „working from home” may seem like a great idea, research shows that rarely can be a good thing, because doing it reduces productivity, happiness and hampers innovation and creative things. Secondly, in our studios we make our models feel themselves at home. They can take their own decisions, not being restrained at all, they can choose their shifts and have a private room, created by their desires. In this way, they don’t feel forced and there is more energy behind them. What`s the most important achievement of Charm Group? What can you tell us about your near future goals? Needless to say, we’d like to be on the top of the mountain, by adapting quickly, cultivating what works and culling what doesn’t. We know what we’re going for and we do it with our eyes wide open. It’s clear that we are living in a highly competition environment, but we are self-confident that what Charm Group offers is what everybody needs. Which would be the reasons for you to reject a model that comes to an interview, but more important which would be the reasons to say after an interview:”Indeed, she has a lot of potentials!” ? It’s fun to be the boss until you have to enforce something. Sooner or later, you’ll have to be able to say „no”. Not everyone that darkens our door is qualified to stay because we make ourselves the greatest and we need the best people to be the best team. Working from 8 to 10 hours a day, I need to be surrounded by people like me, with the same desires I have. Of course that from 2009 until now it happened to pick even „out of the way” people, whether they realized they wouldn’t face what we expect, or we made our point of view, the fact is that our collaboration didn’t last for too long. For those who want starting a studio and get in to this business what pieces of advice would you give? To what details they have to pay attention? Don’t forget that details make the difference. Most of the time, many new business owners aren’t prepared for it, until it really happens. And in my case it was the same. Sooner or later, they have to come up with the rules their business follows and it’s not easy to find the balance of needs and resources. It doens’t exist any rules, any piece of advice or any pattern to keep track of. Did you have a mentor from the industry that not only inspired you but also helped you become the professional business man you are today? The only ones who helped me grow in this industry were, in the beginning, a company with specific expertise. Of course, like everybody else, I was always looking at the others and took from them only the best experiences. It’s like you’ll open a shoes store and you have to follow the trends, to know what people expect, what they want, what sells the most, what colors, what fabrics, you know… It’s the same, but put into practice for this industry. When you’re not at the office, what do you like to do in your free time ? I’m trying to be a better man for my family every single day and I want to believe that I succeed. On the other hand, I’m a traveler, a book lover, a passionate watches collector and I have a great taste for fine tailored clothing. I’m not like the other businessmen and my turnover is measured by the love of my wife and our daughter. Next articleFlirt4Free Announces Easter Egg Hunt Contest with $1,000 Grand Prize! Congratulations for all the good work done Dragos! Interesting step from being in a insurance company and going into the cam studio business. Over the last years studios have been grown out of an secret place known just by insiders to brands, building an environment of glamour around the business. Dragos did a great job in this field and this generates a lot of respect and recognition.